The following picture shows a cheat sheet about the trading method teached in this course. This cheat sheet shows a sample of bullish market, a buy operation and bullish patterns. For bearish markets the method is the same, just flip the graphs upside down and use bearish patterns. 1) Print the cheat sheet. 2) Have several markets available. The best trades don’t always happen on the same market, some times a market might spend months doing nothing relevant. The trader is meant to keep a basket of markets where to pick the best trades. 3) Look at the cheat sheet top left. Draw the monthly price levels and try and understand what’s going on in the market. One of the most important informations is to understand whether the market is going up or down. 4) Look at the cheat sheet bottom left. Draw the weekly price levels and make sure the weekly price is concording with the monthly. 5) Finally look at the cheat sheet right. Find a trade trigger price action pattern that sits on a retracement on a weekly (or monthly) price level. – Only closed bars are valid and relevant. Example: a weekly bar only closes at the end of the week. This means that before the end of the week you are looking at an half created bar which is irrelevant and potentially confusing. You have to look at the bar before it, since it’s the closest closed bar. Same for the daily chart: looking in the middle of the day only shows half made and irrelevant bars. You have to look at the chart at the beginning of the trading day or to ignore the forming bar and look at the one before it. 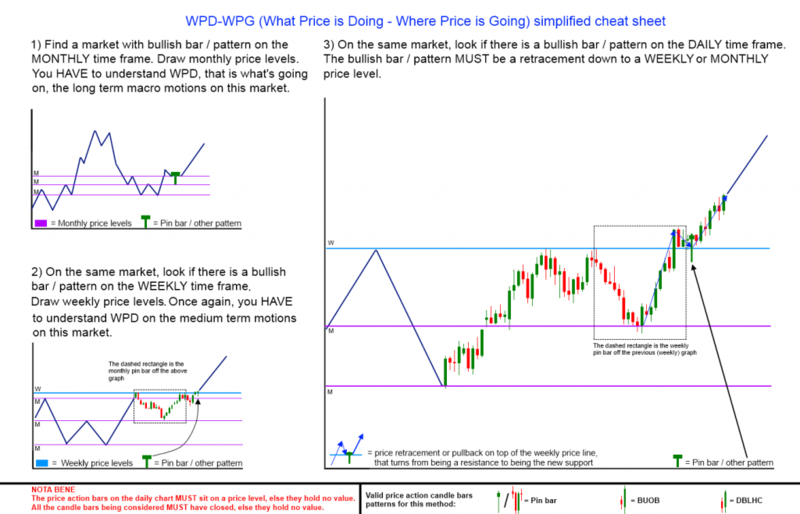 – Price action bars patterns require a context and location. A bars pattern in the middle of nowhere has zero meaning. A bars pattern sitting at a price level is the only kind to consider.